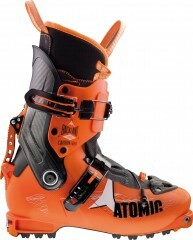 The Light version of the carbon Backland boots has been tuned for speed. With a lighter and even more breathable liner in the nearly frictionless pivoting shell, the boots were made for walking and skinning. You can leave in the Soft Flex tongue with nary any interference with your stride. Then it will be there, along with the Carbon Spine, to give you more oomph on the down. Weighing in near a kilo, the Backland Carbon Light boots are Atomic’s answer for most uphill woes. Lace-able Platinum Light liner (189g) has breathable zones in the sole and mid-foot. Carbon fiber spine adds lateral stiffness and helps transfer power to the ski. Semi-rockered soles covered in Skywalk rubber are nimble on rock. Quick Click tongues (53g) have a soft enough flex to leave in while skinning. Free/Lock 2.0 rear lever offers simple and reliable transitions. 30mm power strap (30g) is supportive and light enough to want to use. Liners are washable so you can fight back against your own stink. Memory Fit shell can be molded along with the liner. Does the weight for the Carbon Light include the Tongue and Power Strap? Hi Matt, yes it does. How is the forward lean adjusted on this boot? Thanks. Hey Kyle, there are 2 oval shaped offset pucks on inside the boot where the buckle connects that you unscrew and flip around to change the forward lean. Super easy, just two screws. Are the stiffer tongues for the regular Carbon version available for purchase to beef up the Carbon Light? Hi Riff, yes they are listed here: Backland Tongues. Any thoughts on buying the light version to be able to do some gram-saving for long days/skimo, then swapping in stiffer tongues and some beefier liners (like pro tours) for days when you want more downhill performance? Would you be able to get (close to) the same stiffness at the non-light version, or are the shells between the two versions that much different in regards to flex? Hi Christian, that's a reasonable plan. You could also go the other route and get the Carbon version and put in a race liner for long days/skimo. Shells are pretty much the same. What is the last width of these boots? The regular Backland Carbon is 98 but I heard these were wider? Hi Scott, these are the same shell size as the Carbons, though with the thinner liner there is effectively more room inside. Note that both boots can be expanded rather easily by putting the whole boot (shell + liner) in an oven provided by Atomic. On the surface, it looks like a Carbon, sans power strap and tongue, changed the liner to a lighter one, and are charging $100 more for it... what am I not seeing? Hi Josh, yeah it does seem curious. The Light version does come with a power strap and tongue, albeit a more flexible one than the Carbon version. The image is taken without the tongue or strap, but they are included.